QINGDAO, April 12 (Xinhua) -- China's unmanned submersible "Hailong III" has collected various biological and geological samples in the southwest Indian Ocean. 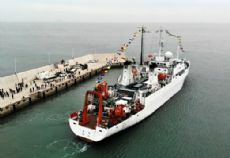 The First Institute of Oceanography said Thursday that Hailong III, carried by its mothership Dayang Yihao (Ocean No.1), is executing its 52nd voyage in the southwest India Ocean. The submersible recently completed three dive operations in a hydrothermal area of the mid-ocean ridge in four days, with the longest near-bottom observation lasting six hours. The institute said samples including macrobenthos, clean seawater, deep-sea fish and deep-sea sediments had been collected. A variety of parameter measurements have also been carried out. Scientists on board said that the submersible had a stable performance, and samples collected during the voyage could help study the ecosystem of the mid-ocean ridge of Indian Ocean.